For a man who has a reputation for being blunt and confrontational, Avigdor Lieberman has kept uncharacteristically silent since taking over in March as Israel's Foreign Minister. His boss, Prime Minister Benjamin Netanyahu, had reportedly asked him to muzzle his hawkish views for fear of riling the Obama Administration. But in his first major interview, which he gave to TIME, the burly Foreign Minister, who says he shrugs off "political correctness," came out swinging. He lambasted the West for not giving more support to Iranian reformists. "This really fanatic extremist regime is still in power, and the young people who are ready to fight and die for change are not getting any real support from the West," he said. "The fact that this regime continues to be an acceptable partner for dialogue is really a bad message. It shows the bad guys are winners." Lieberman also criticized the Obama Administration for demanding that Israel halt construction in Jewish settlements inside the Palestinian territories, saying it is a "mistake." He added, "We are trying to formulate some understanding with the U.S. We don't speak [with the Americans] of building new settlements. We don't speak of expansion. We try to build only within existing construction lines." In quiet but forceful tones, Lieberman said, "We cannot suffocate our own people. You know, babies are born. People get married. We cannot stop life. People want to build a synagogue or a kindergarten." Lieberman also claimed that the Israeli-Palestinian conflict was part of a broader "clash of values between civilizations," and that it was not the key for bringing peace to the Middle East, as many believe. "With 9/11 and terrorist acts in London, Madrid, Bali, in Russia, I can't see any linkage with the Israeli-Palestinian problem," the Moldava native told TIME, speaking in Russian-accented English. He said that Israel is ready to start talks "without preconditions" with Arab leaders, despite an earlier remark he made before taking over as Foreign Minister that Egyptian President Hosni Mubarak could "go to hell." He told TIME, "Even today, I'm ready to start talks with any country in our region. We agree with President Obama's approach to a regional settlement of historical disputes. I'm ready to take a jet to Damascus to meet President Bashir al-Assad." 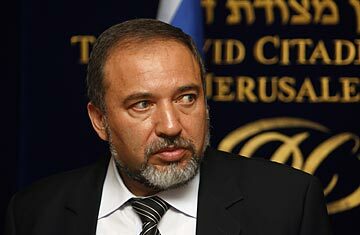 Lieberman said he is also willing to talk openly with the Palestinians. So far, he said, the Palestinian leadership has failed to contact the Israelis after Netanyahu reversed his earlier opposition to a Palestinian state and said in a major foreign policy speech earlier this month that he now advocates a two-state solution. Lieberman said that previous peace efforts floundered because "it's impossible to impose peace, only to create it." And for that, he said, "We must start with practical issues, like getting rid of roadblocks and illegal outposts [inside the Palestinian territories]. You must understand that we used to have 41 roadblocks and now only have 16 roadblocks." But a U.N. agency disputes Lieberman's count, saying there are 69 roadblocks in the West Bank manned by Israeli security services and another 521 unmanned roadblocks restricting Palestinians' travel. Before taking over as Israel's foreign policy point person, Lieberman earned the epithet "racist" among Palestinians and liberal Israelis for advocating that the borderline of a future Palestinian state be redrawn so that large Arab communities inside Israel would lose their citizenship and be carved out. It's a notion that many Israeli-Arabs resist, and they proclaim sarcastically that it's better to remain second-class citizens inside Israel, with its better schools and clinics, than join a Palestinian state that, judging by the current mayhem inside the territory, would be riddled with corruption and appalling services. "Better an Israeli hell than a Palestinian paradise," is one popular saying. But Lieberman seems to have tempered his views, saying that today the "transfer of populations" is neither "acceptable nor possible." He said that even if a Palestinian state were created, Arabs would still be welcome inside Israel, where they currently account for 18% of the population. "Maybe some Arabs would prefer to go to a Palestinian state, but if some want to be Israeli citizens, that's their right," he said. Lieberman sees himself as an outsider in Israeli politics. He still marvels at the fact that he came to Israel as a 20-year-old immigrant  his first job was hauling luggage at Ben Gurion Airport  and now he's the country's Foreign Minister. "It's a great land of opportunity," he said, smiling. In his spare time, he writes film screenplays. "It's a hobby," he said, refusing to reveal the plot to his current work. "This is something for the next stage in my life." Hollywood will have to wait. See pictures of people around the world protesting Iran's election. See pictures of violence used as terror in Tehran.